The Bear Shop is not a name you’d expect to denote Wales’ biggest tobacconist’s, but the reason for it is obvious when you look through the window to the right of the door. Here stands a Russian bear which is c.200 years old! The bear, known as Bruno, arrived c.1906, when the shop was in nearby St Mary Street. A man left it there with no explanation other than that he’d expected to give it to someone else, who had rejected it. Bruno was two-thirds fully grown when he died. Although he looks like a stuffed animal, his skin is leather-like and rests on a frame. The inside is hollow. Bruno stood sentry outside the shop in St Mary Street during dry weather, attracting potential customers. In the late 1980s, some passing rugby fans broke off his front paws, which were later re-attached with care. Bruno has remained indoors ever since. The outdoor photo of Bruno is shown here courtesy of the Bear Shop. The business originally traded, from 1870, as WA Lewis in nearby St Mary Street. When founder William Arthur Lewis died in 1928, the business passed to his daughter Winifred and her husband Harold Darbey, trading as Lewis Darbey & Co. 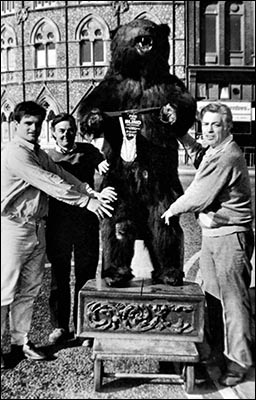 It moved to Wyndham Arcade in 1990 and remained in the Darbey family until 2000, when it was bought by AE Lloyd & Sons and was renamed The Bear Shop. In 2010 the business was bought by cigar merchant Havana House and today is one of Britain’s largest stockists of pipes and rolling tobacco. One room is devoted to displaying cigars from around the world.